For the first swap group, I selected Sun Print Grow in Turquoise, and for the second swap group, I selected Sun Print Sphere in Orchid. 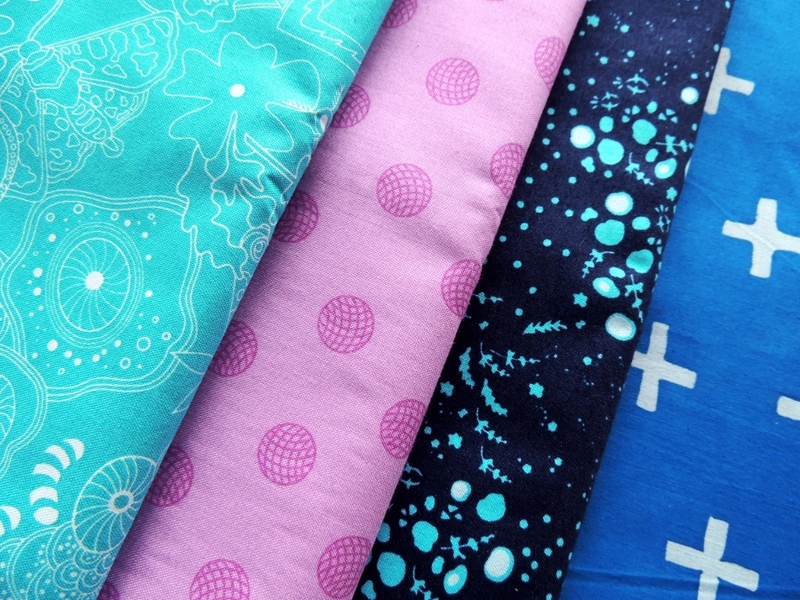 The Sun Print Grove in Blue and Handcrafted Indigos, Plus in Hawaii just seemed like fabrics I needed in my stash. Speaking of adding to my stash… I ordered 2 yards of each print which is more than enough to add a generous 1/2 yard of the charm swap fabrics to my stash, too. I didn’t know fabric had those capabilities, jump indeed!!! Super choices . Love them. Can’t wait to get my special delivery of charms!! Smart stashing! It’s always best to order more than you need of pretty prints like these. It will be nice to have some left over for yourself after the swapping is done! Love those fabrics, different shades of blues and a pink together are a great combination, especially for the winter months in the Northeast. Just guessing that the turquoise one is Hawaii. You can never go wrong with Alison Glass fabric, and when it jumps…you let it! Beautiful! That’s my idea of exercise–let the fabric do the jumping, then PUSH “order”. Great colours. I especially like the turquoise and orchid. Jumping fabric……never happens here, lol. YESSS. I hadn’t bought a huge fabric order in a few months, and in the last week, I placed two… oops. I can’t wait for my AG swap fabric to get here. I should have bought the spheres – hopefully I get some in the swap! Don’t you hate it when those fabrics just jump in your cart like that? 🙂 Happens to me all the time. Are there any openings in the charm swap? I missed both sign ups. U ordered extra prints . oooooh I love me some AG! Great choices! Very pretty selection of Allison Glass. Honestly, I don’t think there is a single print of hers that I don’t like. That charm swap will amazing. It was really difficult for me to restrain from signing up. I have stacks of charms thought and couldn’t justify adding to the piles. However, I am seriously looking forward to seeing some pictures of the assortment you all end up with. I will be seriously drooling over it. O this fabrics look so beautiful. Have a fun swap. I’m interested in seeing how your swap comes together. Lovely fabrics. I’m not surprised some extra bits sneaked into your cart.